SRINAGAR: In held Kashmir, Indian troops killed two Kashmiri youth in Islamabad district on Friday night. The troops killed the youth during a cordon and search operation at Shashtargam in Dooru area of the district, reported Radio Pakistan. 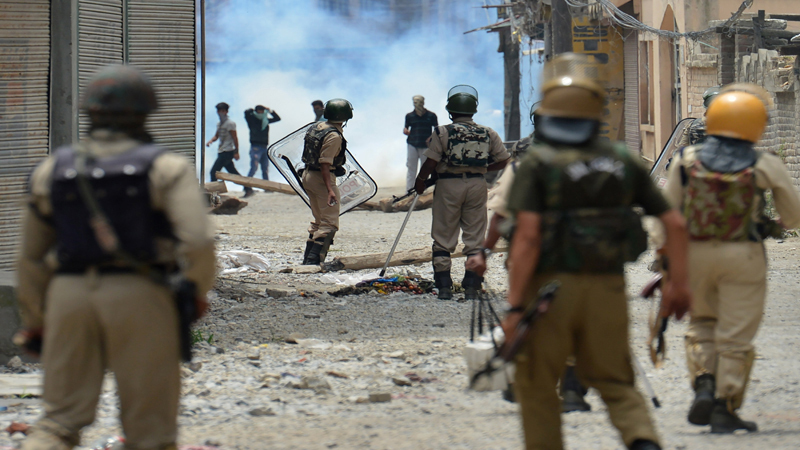 Meanwhile, people staged forceful demonstrations and raised pro-freedom and anti-India slogans when Indian police and troops launched a cordon and search operation in Sirnoo area of Pulwama district. The police fired teargas shells to disperse the protesters. However, protesters compelled the Indian forces to call off the operation. Earlier this month, during the 37th session of Human Rights Council in Geneva, United Nations High Commissioner (UNHC) for Human Rights Zeid al Hussein called the situation in Kashmir as a grave concern. He announced that UN will launch a major report on Kashmir in June 2018 when next meeting of UNHRC will be held. In September 2017, Amnesty International repeated its demand for a ban on pellet guns used by Indian troops against Kashmiri protestors. In a report, the amnesty stated that 88 people whose eyesight was damaged by the metal shots of the gun, were interviewed in the held Kashmir. Indian forces have been using the pellet guns since 2010 as “non-lethal” weapon after wide-scale civilian protests against Indian occupation.